The tradition of celebrating Valentine’s Day has come about through the blending of legends and tales relating to the death of early Christian saints. Valentine’s Day is thought to have originated with a particular Christian bishop who performed secret marriage ceremonies in defiance of the Emperor’s law. Valentine was eventually imprisoned and legend has it that before his execution on 14 February, he left a farewell love message signed ‘from your Valentine’. This phrase is still in use today as the traditional Valentine’s Day message to a loved one. References to Valentine’s Day can be found in much English literature. Many of the romantic poets refer to St Valentine in their prose and Ophelia bemoans Valentine’s Day in Shakespeare’s Hamlet. Valentine’s Day cards and gifts are frequently sent anonymously … The recipient must try and guess the name of the sender and sometimes may never discover their identity. While sending paper cards is still popular, more and more people are choosing to convey their affection via SMS or email, and there are many websites that provide personalised electronic cards. 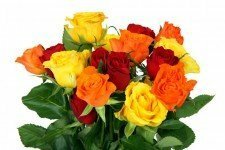 However, the giving of flowers, through the ages, has been a wonderfully consistent factor. The day is also a favourite day for marriage proposals and weddings. The red rose is a traditional symbol of love and passion and has appeared in paintings, poetry and songs for hundreds of years. Sending a single red rose on Valentine’s Day is usually understood to mean ‘I love you’. Thank you so much for the back ground information on St Valentines Day, Elsie. It was a very informative read … I wish you well with your flower sales.